Here is another golden SEO tip for beginners: Without a good linking strategy, your website is dead in the water; but with the wrong kind of linking strategy, you will put your site in an even worse state. Linking strategies are among the most innovative aspects of search engine optimization. Links determine your website’s popularity and they keep the traffic flowing to you. But not all link strategies are created equal. Far from it. There is one linking strategy that is clearly superior to all the rest. According to SEO experts, one-way link building rules them all. What is one-way link building, and how is it better than any other link-building campaign? Consider the two link-building strategies that are used the most often: reciprocal linking and one-way linking. Let’s discuss how both of them work, examine their advantages and disadvantages, and see how one outperforms the other. As its name suggests, reciprocal linking is a strategy in which you ask another webmaster to link to your site, and in return you link back to his or hers. One of the biggest advantages to using this strategy is that it provides your website with free exposure. And if the site you effect a reciprocal link with has a high pagerank or is a good authority site that enjoys a healthy amount of traffic, you can be sure that your site will enjoy a surge in traffic as well as an increase in ranking. However, search engines have recently stopped placing as high a value on this type of linking strategy. This is not to say that Internet marketers should give up on reciprocal linking altogether; rather, you should stop focusing your primary energy on creating reciprocal links. The main and perhaps only disadvantage to using reciprocal linking lies in the fact that your traffic is shared. This strategy may encourage your visitors to wander off to all the other sites you are linking to. And if you’re running an e-commerce site, while you may be getting traffic from other sites, you could also be losing some opportunities in sales as your regulars visit those other sites. In the worst case, the imbalance in traffic could all lean in the other sites’ favor. With one-way link building, your site gets inbound links from other Internet locales without your having to link back to them. News sites, entertainment sites, and mega-prolific and ultra-authoritative bloggers enjoy a great amount of inbound or one-way links on a consistent basis. What’s great about this approach is that you don’t have to worry about possibly linking back to bad sites. Most importantly, one-way links are judged by search engines to be the most valuable linking strategy, because inbound links signify a vote of confidence on the part of other sites in favor of yours. This means other site owners have found your website to be highly valuable and they are recommending your content to their visitors. Keep in mind that one-way links are most beneficial if the sites that link to yours have a greater pagerank than yours, or have achieved roughly the same level, at least. When you can attract links from such sites, search engines will ultimately award even greater value to yours and eventually hand you the golden key to the next pagerank. Of the two, one-way link building strategy definitely takes the blue ribbon. As mentioned earlier, search engines no longer place as much importance on reciprocal links as they did several years ago. Plus, when you go for reciprocal links, you run the risk of linking to a site in a bad neighborhood, where a mass of links from scam and worthless websites converge. And there’s a chance that the search engine police could penalize you for that. 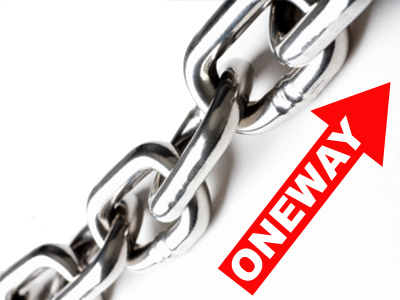 One-way links, on the other hand, are more natural and provide your site with highly targeted traffic and, even more desirable, that all-important Google juice. It doesn’t matter which sites are linking to yours, as long as those sites link to you in a way that does not raise red flags. If your business’s website has only recently gotten launched, remember that you want links to come from authority sites and those that have greater pagerank than yours. In the case of submitting content to article directories, be sure to post them in the appropriate categories to help the search engines properly identify what your site is all about. You also want to keep your website’s content fresh, interesting, highly valuable, and engaging so your other visitors and websites you’re not aware of will have new reasons to visit and link to you. Most importantly, create one-way links to your site on a constant basis. Make it an integral part of your online marketing strategy. Before you know it, your site will enjoy an accelerated increase in pagerank and authority.